seon club notes – part two – Wake Up and Laugh! I’m forever asking questions I’ve asked before, it must be really annoying for Sunim and everyone in the group. But there I was, asking, once again, about relying on the Buddha and transference of merit. Surely the Buddha, in all his compassion, sees my suffering and will give me a hand. Isn’t that what Amida Buddha promises? The whole group took Sunim’s analogy and ran with it, saying that it is possible to make our Buddha-naure, or Juingong, our centre of gravity rather than giving that role to our small selves, and that we can rely upon that Buddha-nature to always spring us back up. I’m sure they are right. I’m also sure that Sunim is spot on; even if (or rather, when) Amida Buddha does carry (or perhaps kick!) me to the Pure Land, unless I make some effort and unless I develop the skill and habit of relying completely on my own inherant Buddha-nature, I may soon find myself back where I started! Exactly! Little point being there if we don’t know (learn) how to enjoy it! Thank you for contributing another great photo Joseph! 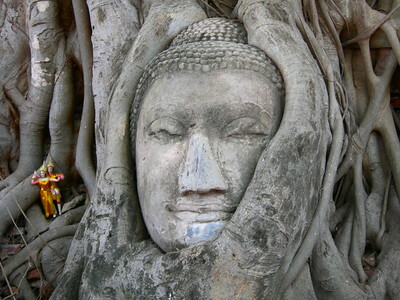 That must be the most photographed Buddha in all of Thailand, yet your picture really brings out its freshness and vibrancy. Thank you so much.